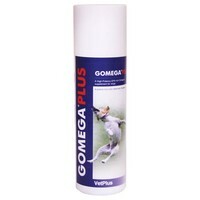 Gomega Plus is a concentrated purified source of Omega 3 Essential Fatty Acids (EFAs) that help to promote cardiovascular health and kidney function in dogs. Essential Fatty Acids (EFAs) play a number of vital roles in the structure and function of the body and can also be used to aid appetite, brain function and joint mobility. Fish oil is the optimal and direct source of pre-formed Eicosapentaenoic Acid (EPA). These are the long chain Omega-3 polyunsaturated fatty acids which are required by the body.